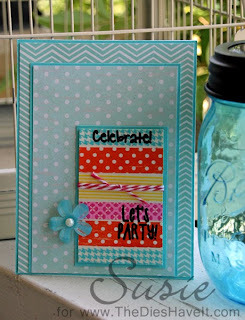 Created 4 Creativity : Let's Party!! This is the first day of Online Card Classes Summer Camp 2 and I just couldn't wait to jump in. This week we have a fun color combo and three sketches to follow. This is my take on the one of the sketches using the colors of the week. I used two different My Minds Eye paper packs for my card background - Lucky in Love and Up & Away. The color palettes are similar. My focal point is a piece of white chipboard covered in Washi tape. Easy peasy! I heat embossed my sentiments which are from Sweet & Sassy Stamps. Then to finish my card I added some twine and one little Pearl Blossom from Queen & Co.
And trust me - I couldn't have made this card without my Perfect Layers tools. They make the most perfect mats. Be sure to click on the link to the right to see how they work. Those patterns look great! Awesome take on the sketch! Wow - your first assignment is a knock out! Love what you've created!! I like your use of patterns while still keeping with the colors suggested in our assignment. Great card! Really like your card. It is simple, but very effective. Thanks for sharing your talent with us and looking forward to seeing more of your work. Great card - love the mix of geometric patterns in those terrific colors! Beautiful, love the papers and design. I love your card. It is a great take on the sketch! Your choice of pattern paper is fab! 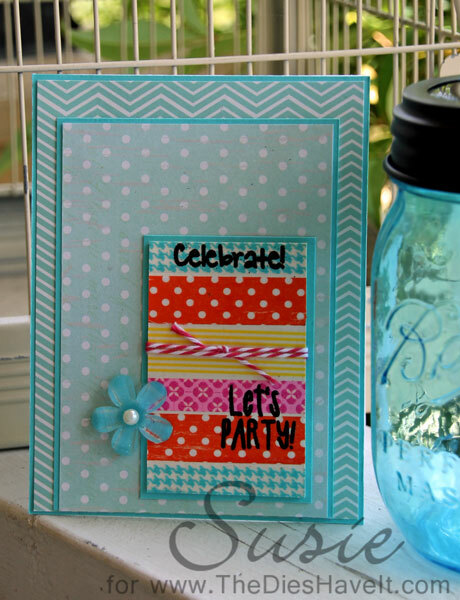 LOVE the pattern mixture -- this is a fabulous card!